Iximché was the capital of the Kaqchikel realm, founded by refugees from the Quiché kingdom in the 1470s or 1480s (Figure 1). The Quiché attacked and tried to conquer the city at least once. This attempt met with failure and the Kaqchikel captured many Quiché warriors. Spaniards under Pedro de Alvarado arrived in the highlands in 1524. 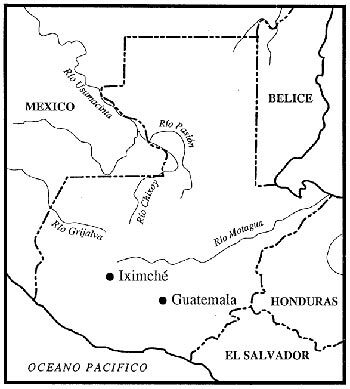 With the Kaqchikel as allies, they conquered the Guatemalan polities which had been enemies of Iximché. On July 25, Alvarado founded the first colonial capital of Guatemala near Iximché. This action led to the outbreak of hostilities between the Kaqchikel and the Spanish and the ultimate destruction and abandonment of Iximché in 1526. George Guillemin, a Swiss archaeologist, excavated Iximché between the late 1950s and the early 1970s. His main interest was architecture, and his crews uncovered large expanses of the site, exposing and then restoring plazas, palaces, altars, and temples. Unfortunately, Guillemin was much less interested in analyzing the large amounts of materials that came from the digging. His excavation notes, archived at the Centro de Investigaciones Regionales de Mesoamerica (CIRMA) in Antigua, do not mention the location, associated artifacts, or basic layout of some complete skeletons. Even worse, for years the excavated materials were stored in what was essentially a chicken coop. Bags broke open, artifacts and bones from various contexts became mixed together, and tags with provenience information rotted away or became separated from their bags.